Let’s find out a little more about your favorite podcast hosts. 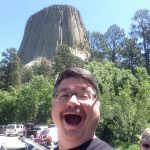 Every Thursday night LANMonkey brings the Canadian content to the #CNWPodcast as a regular co-host of the Caching in the Northwest podcast, and represents the “true, north, strong and free” geocaching listeners by being unashamedly Canadian. Sorry if that was a bit much. Geocaching with his partner in crime, Mrs. LANMonkey, since Aug 2012 they’ve geocached in Europe, Cuba, and in most of the “NorthWest” of North America seeking out fun and interesting caches and locations to share on their YouTube channel “LANMonkey’s Geocaching Adventures” (#LMGA). Come find us at the next event if we’re not out hunting down an Earthcache, and subscribe to our YouTube channel, follow us on Twitter, Instagram, or Facebook, then come along for the adventures! witzend found his first geocache in 2004 while visiting his hometown for a high school reunion. Once returning home, he took The Bad Cop (now Chris of the NorthWest) out to share his new-found hobby, and the bug bit both of them. Life has a way of getting busy from time to time, and while the frequency of caching outings may have slowed, the interest remains. In much the same way that witzend got Chris Of The NorthWest started in geocaching, it was Chris Of The NorthWest that brought witzend to the world of podcasting. Now, they can be found together with LANMonkey every Thursday night. A “serial hobbyist”, witzend has many varied interests, and you just never know where you will find him, although it’s rarely on the geocaching trail. In fact, he really doesn’t bring much actual geocaching value to the table at all, but he reads things well, so we keep him around for now. 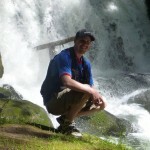 As with many life stories, it starts with a friend saying, “You gotta look at this!” witzend took Chris Of The NorthWest out geocaching in 2004 and started what has become a life changing hobby. A few years later, he asked an innocent geocaching question on Twitter and out of that, the Geocaching Question of the Day was born. After 4+ years of daily questions on Twitter the GQotD was turned over to fellow NorthWesterner Lookout Lisa. Chris got started in podcasting when XpunkX invited him to read the Geocaching Question of the Day in a segment on the Geocaching Podcast. Chris Of The NorthWest and witzend started the Caching in the NorthWest podcast on April 4th, 2010. Originally the podcast started as a monthly 1+ hour long show. After 20 shows and too much scheduling troubles, a format change was due. 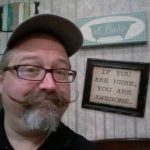 The much needed addition of LANMonkey as co-host and changing Caching in the NorthWest to a somewhat shorter, weekly podcast revitalized the flagging show. Continuing his podcasting career, DarrylW4 invited him to co-host GeoGearHeads for it’s January 2012 launch. Since that time, GeoGearHeads has become one of the predominant geocaching podcasts. Chris lives, mows his lawn, works and geocaches in Tacoma, Washington with his lovely wife and 2 children.